Can a ramp for people with disabilities make a difference in a big city? The answer may seem obvious to many, but I encourage you to read on to find out the complexities and nuances surrounding the issue of mobility in a large Latin American metropolis. This is a true story. I was attending the launch of a project “Mainstreaming Inclusive Design and Universal Mobility in Lima ”project - financed by the Japan Policy and Human Resources Development (PHRD) program and I was surprised to see people in wheelchairs asked to move away from the table where coffee, pastries and fruit were being served during the break. At the same time blind, deaf and people with cognitive impairments, among other disabilities, were being actively welcomed. About to intervene, I noticed that the waiters were guiding those in wheelchairs to a special area where they were given a small tray to place on their knees with coffee, pastries, and fruit. Approaching this group, I asked how they were finding the event. They explained they were happy with how carefully it had been organized, showing sensitivity to each type of disability. People in wheelchairs are at a disadvantage, I learned, when approaching a table since people on two legs are more able to maneuver and are therefore served first. By the time the people on wheelchairs get there, there is frequently little left. Not here, clearly. This event also marked the first consultation the $2.5-million PHRD-financed project undertook with Lima’s disabled community. The disabled community will be consulted at every stage of the project’s implementation stage. And these consultations will be critical to help the project achieve its objective: improving the Lima’s ability to manage the mobility needs of people with disabilities. It also looks to mainstream the needs of disabled individuals when planning and installing sidewalks and public transport facilities. 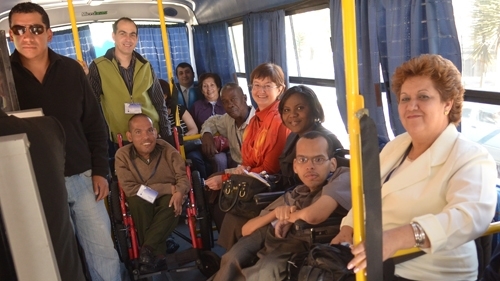 The project includes identifying current limitations faced by the disabled in Lima and developing mechanisms and tools to support inclusive mobility. The goal is to undertake small construction works to retrofit an initial set of streets to make them universally accessible: installing ramps for wheelchairs (and strollers), podotactile surfaces which allow the visually impaired to feel where the sidewalk ends, and pedestrian crossing which beep when it is safe to cross among others. The lessons learned from both the pilot and the project will enable Lima to advance faster towards achieving the goal of retrofitting the entire city to make it as close as possible to universal design. As a signatory of the United Nations Convention on the Rights of Persons with Disabilities, Peru has committed gradually retrofit public spaces to make them more accessible for people with disabilities. At the event I spoke about the scope of the project, how consultations were critical to its implementation, and about the pilot to be carried out. I concluded by answering a question that was asked repeatedly during the consultation: who should finance this broad, gradual and mandatory public space retrofit? Retrofitting an entire city the size of Lima—9 million inhabitants—could cost hundreds of millions of dollars. Consultation participants were concerned that as those who would primarily benefit from the work, they would have to foot the bill. My answer was categorical: society at large should finance this retrofit, not just the main beneficiary. Why? One reason is that currently nondisabled people usually earn more. So they can afford to pay more. But the key reasons lie in the modern definition of disability and in one simple fact. The current definition states that disability is when someone tries to interact with an object or infrastructure but cannot carry out its intended task. If I were to remove my glasses, I would immediately become a disabled person. Without them, I can do very little. The simple fact of the matter is that all of us stand a significant risk of becoming disabled. Aging is one factor, another is mere chance. Accidents happen, people are injured. Paying for the retrofit is therefore like buying insurance to help us all face a reality of life: we will all reach a point most likely where that ramp and that podotactile surface will be quite helpful. My husband has been using a wheelchair for many years because of his muscular dystrophy. We have been together for over 5 years and never visited my home country (China) together for various reasons. The main concern of traveling to China is accessibility. Finally, we decided to put the trip on our agenda for summer 2014. For a trip like this, we, especially my husband, spent a lot of time planning because of limited accessibility, even in big cities. China has gone through tremendous growth in the past 20 years. There is ongoing demolition and construction work thorough out the country on a scale perhaps never seen before. Even with newly constructed buildings, however, often times they are not accessible for people who use wheelchairs (or, for that matter, the elderly with limited mobility and parents with kids in strollers). In China’s case, this is not a matter of insufficient resources to build the infrastructure. It is the people’s mentality where disabled individuals are not treated as equals, hence, the lack of consideration for having infrastructure in place. At a minimum, it is because of a profound lack of awareness. Although I have seen firsthand big improvements in Chinese society in recent generations, much more progress and evolution in thinking needs to occur for those with disabilities. I understand that it is a process; America did not adopt the Americans with Disabilities Act until 1990. I am hopeful for what the future will bring. You would have thought there would have been advances and changes to the way buildings are operating to become more accessible to those in a wheelchair however unfortunately this is not always the case! Agreeing with above post..lets see what future brings! Civic infrastructure in major Indian cities still fails to provide for the needs of people with disabilities. Every year, the monsoon brings with it an outpouring of angst against the poor state of our civic infrastructure. This is completely justified. But spare a thought for a category of people for whom accessing infrastructure is a daily struggle, no matter what the season. According to the WHO and World Bank report on disability, 2011, approximately 15 per cent of the world's population lives with a disability. Applying that statistic to India, there must be about 186 million people with disabilities in the country. Neither public infrastructure, nor awareness, nor the sensitivity of government personnel, are in any way commensurate with this number. Recent reports of the humiliating and insensitive treatment of an amputee by CISF personnel at the Mumbai airport only confirm this. Despite a major overhaul of Delhi's infrastructure for the Commonwealth games in 2010, accessing pedestrian facilities — something that most people take for granted — is still a nightmare for disabled persons. For the most part, footpaths themselves are non-existent. Where they do exist, access onto and along them is still a major concern due to issues as innocuous as uneven or steep kerb ramps, poor paving and myriad obstructions. Often, they are too high to be accessed because they have no kerb ramps at all. At other times, access to them is blocked by bollards intended to prevent vehicular traffic from getting onto them. While motor cycles and scooters still find a way onto footpaths, people using wheelchairs or crutches find it difficult to bypass these obstructions. During the recent "refurbishment" and beautification of footpaths in some localities of Delhi, tactile tiles — intended to assist pedestrians who are visually impaired — were incorporated into pavement designs. But they have mostly been used for decorative purposes. Many a contractor and engineer thought the bright yellow of these tiles was intended to visually jazz up pavements. It is a travesty that these guides, provided to orient and navigate a blind pedestrian, often lead head-on into trees, poles, manholes etc. Road crossings are not designed to be inclusive either. Frequently, they do not have median refuge areas that mobility-aid users can access, because they are built at a considerable height. There are no audio signals at pedestrian crossings that could alert a visually impaired person as to when it is safe to cross a road. Access features like ramps or lifts in subways and foot overbridges are often missing. Did anyone imagine that there could be so many variables to come to grips with before one could cross a road? To the Delhi administration's credit, we now have low-floor buses with access ramps and space for wheelchair users. Bus shelters have also been made accessible through tactile pavers, ramps and handrails. However, buses do not have precision-docking systems and mostly do not stop at the actual stop. Passengers have to get onto the road in order to board buses. This negates the utility of the low-floor buses and ramps. The solutions to these problems are not rocket science. The Indian Roads Congress has published codes and guidelines, as has the Delhi Development Authority through its Unified Traffic and Transportation Infrastructure (Planning and Engineering) Centre (UTTIPEC). The UTTIPEC Street Design Guidelines are applicable to Delhi/NCR. It mandates that all road owning and civic agencies comply with street designs standards to make mobility safe, dignified and comfortable for all pedestrians and public transport users. The implementation of these access requirements is imperative to further the goal of "universal accessibility", to create seamless travel chains from origin to destination. Lack of access at any point breaks the chain, and negates the benefits of infrastructure that is accessible. The lack of enforcement and punitive action for noncompliance is the problem. There is nothing to compel government bodies to implement these measures. The only way to change this scenario is for each state to incorporate such guidelines into their road/ streetscape standards, by law, and approval/ tender processes. A few have done so, but most have not. Without these changes, citizens of this country living with disabilities will continue to be short-changed by a government that is failing to discharge its obligations to them. The Persons with Disabilities Act, 1995 and the UN Convention on the Rights of Persons With Disabilities, which India has signed and ratified in 2007, stresses the importance for "persons with disabilities to have access, on an equal basis with others". There are moral, legal and commercial benefits to providing universally accessible street infrastructure. It is time that we demanded quality and safe pedestrian infrastructure. Our Constitution guarantees us freedom of movement throughout the territory of India. It is time to fully claim this right. Persons with disabilities should be given priorities and access to streets and walkways. They should live a normal life too. Thanks for sharing your stories. Keep it up! People with disabilities should be catered well and meet up with their needs for a proper access to mobility.